Parma Number 31: Waterloo Hotel … Shame about those cheese rations! The Verdict: After some jiggery pokery with the venue for tonight’s Parma (you can read about that here: https://brisbanebestparma.com/2015/08/05/the-august-schedule-a-venue-change/ ), the Waterloo Hotel presented a happy respite from the madness of venues removing chicken parmigiana from menus. There were a lot of parts of this Parma that were quite good. That said, there was a paucity of cheese that meant there was no way this could be Brisbane’s Best Parma. Chicken: The chicken piece on the Waterloo Hotel chicken parma was very large and had been well cooked. It was also well crumbed and tasted great. Tomato Sauce: Whilst my main complaint about this dish was with the cheese it must be said that the tomato sauce was also quite sparse. This was a shame because it was also quite tasty. I was left wanting more. Ham: This meals absolute hero. Where there was too little of the sauce and cheese, the ham was plentiful. It also tasted great. Cheese: The picture above really tells the story here. There just was not enough cheese on this chicken parmigiana. From a coverage perspective the cheese did not cover the chicken piece and where there was melted cheese it only did so very thinly. The cheese that was on the chicken piece also was pretty bland. Side Dishes: If the ham was the hero of this dish, the side dishes were more than effective “Robins” to the ham’s “Batman”. The chips were well cooked, crisp and seasoned perfectly. The salad was a very well put together and well dressed. These accompaniments were absolutely nailed by the chef. Presentation: I could not see most of the chips on the plate which tells a large part of the presentation story. Despite this the chips were still excellent but it was disappointing that such a large meal was squashed onto a smallish plate. The Venue: The Waterloo Hotel advertises itself as “the Valley’s Original Pub” and, whilst it has gone through a major refurbishment since I used to frequent it in the late 90s / early 2000s to see some classic Australian pub bands play, it still retains a lot of its old school charm. My chicken parmigiana cost $19.95. The Final Word: Why was there so little cheese on such a large piece of chicken? This element as well as a sparse spreading of tomato sauce were real disappointments in what was otherwise a pretty good dish. 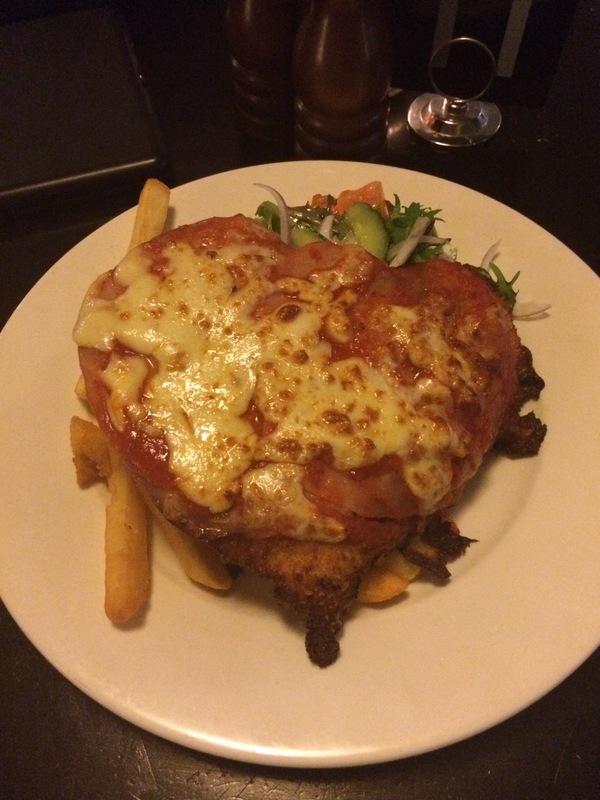 This entry was posted in Uncategorized and tagged Brisbane, brisbane's best, brisbane's best parma, chicken, chicken parmigiana, Waterloo Hotel. Bookmark the permalink.